When President Donald Trump rails against alleged immigrant gang members as “animals,” as he did last month, he’s reducing complex (and highly political) issues—like the presence of MS-13 in the United States—to a fearsome cartoon of snarling packs of subhuman marauders. Vintage Trump, right? But local media, nowadays lionized as a check on Trump, resort to the same strategy, playing fast and loose with the inflammatory term “gang” and deferring and time and time again to questionable police tactics. As FAIR’s Adam Johnson wrote two years ago (“Media Convict Scores of ‘Gang Members’ on NYPD’s Say-So—No Trials Necessary,” 5/2/16), local dailies in New York City were instrumental in convicting alleged gang members in the court of public opinion before anyone had ever even seen a judge. Most other local media outlets took the same approach, never bothering to ask if the scores of people arrested and perp-walked by police as violent gang members could actually be innocent, or unfairly swept up by a police department (in)famous for its dragnet approach to public safety. On the gang sweeps, the New York Daily News led the way with its 2015 “Gangs of New York—and How Close You Live to Them” special feature (12/13/15), which included a map purporting to show “where gangs and crews operate,” based on data provided by the NYPD. 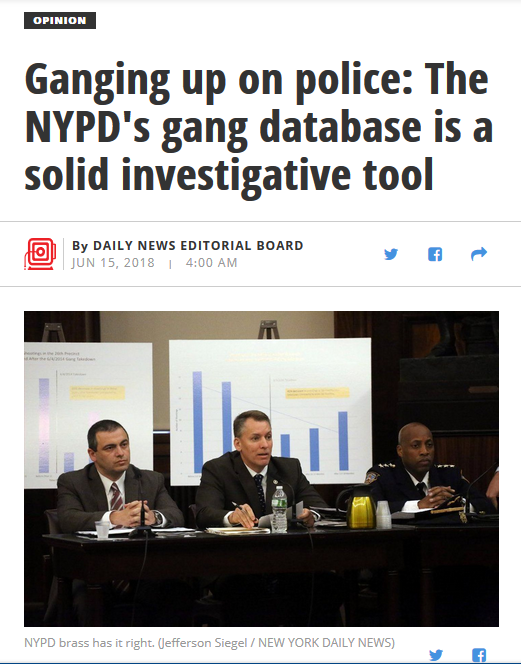 It’s little surprise, then, that after community legal advocates criticized large-scale gang raids, leading to public hearings questioning the tactics, the News‘ editorial board quickly sided with police on a key tool: so-called gang databases. The Daily News (6/13/18) asks critics to quit picking on the NYPD. 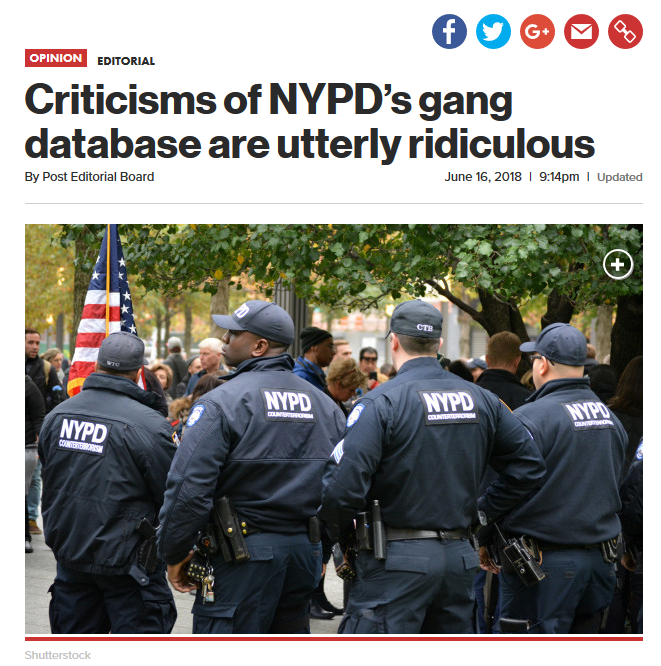 Editorializing in favor of a database kept by the NYPD that no one knows they’re on—and therefore cannot challenge their inclusion in—the News (6/13/18) shrugged off community concerns as “alarmism,” and called the collection of people on the database (some as young as 13 when added to it) “good police work.” The editorial headline “Ganging Up on Police: The NYPD’s Gang Database Is a Solid Investigative Tool” told readers it was the police who were under attack, and conferred legitimacy on a shadowy database that the News‘ own reporting (6/12/18) suggests can negatively impact people for years. Local police gang databases can present serious legal implications for those marked as gang members, such as increased bail, harsher sentencing, erosion of presumption of innocence and even increased chances of deportation. Lawyers and activists have suspected local gang database information is shared with federal agencies like Immigration and Customs Enforcement (ICE), sometimes even putting people trying to avoid gangs on the deportation block (New Yorker, 1/1/18). In fact, a new report released on the same day that Trump made his “animals” comment says that gang designations have led to increased deportations of young immigrants in New York. The report also points to “media coverage in certain outlets” that have “exacerbated the view of MS-13 as a dangerous, invading army of foreigners,” thus “sowing fear around the country.” Are these concerns alarmist? Or, as the New York Post‘s editorial board headlined, “utterly ridiculous” (6/16/18)? For News and Post readers, the editorial board positions must have sounded awfully familiar: They were almost indistinguishable from the police department’s position, which was published by the News (6/12/18) the day before key hearings by the New York City Council. An editorial mistake (8/13/13) the Daily News doesn’t seem to have learned anything from. Not just the editorials but the whole scenario should feel familiar, since we’ve been here before. 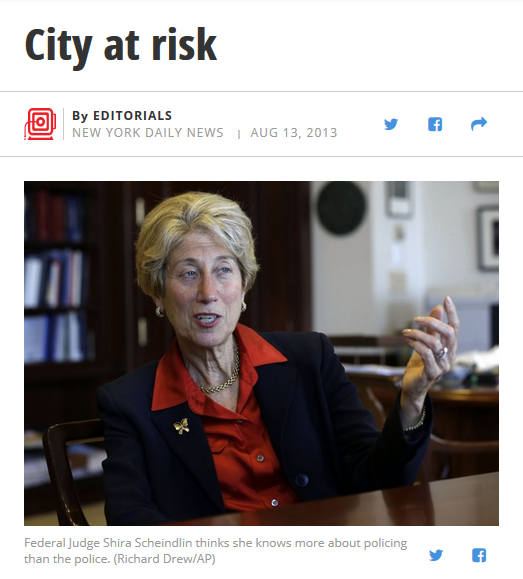 Nearly five years ago, as the NYPD was being criticized by community and legal groups over its Stop and Frisk program, the News‘ editorial board (8/13/13) sided with the police department, predicting “the ravages of lawlessness and bloodshed” if police efforts were curtailed. That didn’t happen, and the News, three years later, apologized on its pages (“We Were Wrong: Ending Stop and Frisk Did Not End Stopping Crime,” 8/8/16). You’d think after being so spectacularly wrong on Stop and Frisk, the News would take the lesson to be more skeptical and wary about police practices. Alas, no, the editorial instinct is the same: support the police department to the point of echoing its talking points. The News and Post couldn’t even bring themselves to follow even the most basic journalistic practice of asking for more information. There are still essential questions around the database and the actual impact of gangs left unanswered. The NYPD and the News, for example, claim the database currently has only about 17,500 New Yorkers listed. However, a Freedom of Information request by CUNY Law School’s Babe Howell suggests over 42,000 names, based on information she received from the police department itself. The NYPD and the News say that about half of all shootings in the city are “gang-related”—which would include suspected shooters and victims that the police allege to be gang members. However, seen in the broader context of New York City, which is experiencing record low crime, “gang-related” crime accounts for 1.7 percent of overall crime. The numbers get even lower for “gang-motivated” crime—crime done in the interests of a gang, according to police—which is at less than 0.1 percent (The Intercept, 6/11/18). Then there is the key argument over whether the NYPD should have arbitrary power over designating who, in fact, is in a gang. The criteria police use is remarkably loose: simply “associating” with gang members, living in certain neighborhoods, having certain tattoos and even wearing certain colors. With criteria like these, which scream guilt by association, it’s hardly surprising that 99 percent of people added to the list are non-white. With remarkable disparities over how far-reaching the database really is, the extent to which gang violence actually affects the city, as well as the central question of who is actually in a gang, the editorial position of two of the city’s major newspapers would seem, at the very least, premature. There is, of course, nothing to lose for members of the News‘ editorial board. As I wrote earlier this year in Injustice Today (now The Appeal), there are no measures of accountability for media when they support destructive police policies. While some media outlets may apologize years after the policies have upended people’s lives, they are free to continually support more potentially destructive policies in the future. I have been one of many organizers pushing back against the database and the NYPD’s gang sweeps. And, in fairness, the News did publish my opinion piece (6/13/18) on the gang database. But that doesn’t amount to balance in their pages when both the reporting and editorial weight is thrown behind the police, time and time again. 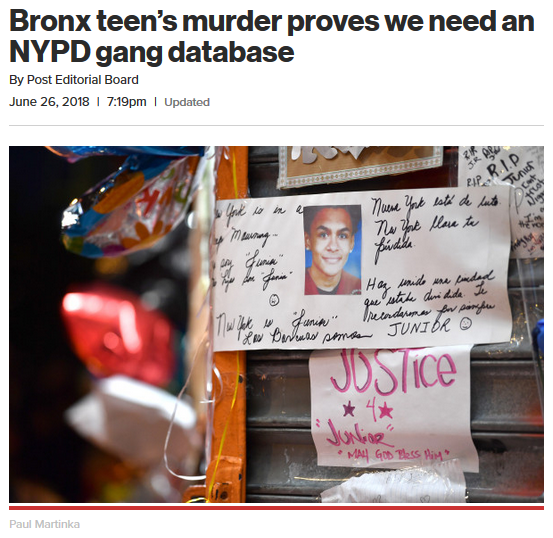 For the New York Post (6/26/18), a murder that happened while the NYPD had a gang database proves the need for a gang database. A recent, horrendous murder of a 15-year-old Bronx boy by alleged gang members could make media coverage worse. The Post (6/26/18) has already jumped on the story to make the point that his death “proves we need an NYPD gang database.” Three years ago, the Post (5/31/15) similarly spotlighted shooting murder cases to make the case that New York City should bring back Stop and Frisk. What the Post wanted then, as they do now, is to unleash the police—who they say have been “handcuffed” by the advocacy of “radicals” and “cop-haters”—to do whatever they want. While the murder has rightly stirred outrage on social media and in the community, is the answer to ramp up aggressive police enforcement? The Post presents the false choice that in order to prevent violence, the police must be enabled in a way that could lead to further injustices. In the 2007 report Gang Wars: The Failure of Enforcement Tactics and the Need for Effective Public Safety Strategies, Judith Greene and Kevin Pranis wrote about the failures of gang suppression efforts across the country to actually reduce gang violence. The way media might further intensify police gang tactics could impact a growing national conversation and empower the most dangerous elements of the Trump administration. Last year, after a string of brutal murders in Long Island, reportedly by MS-13, it was Trump Attorney General Jeff Sessions who arrived to declare war on gangs. Much of this is happening as activists are making some headway in challenging anti-gang tactics. Activists in Chicago, where a Guatemalan immigrant was arrested by ICE last year after being incorrectly identified as a gang member, recently filed a class action lawsuit challenging the Chicago police department’s gang database for being inaccurate and discriminatory. In Los Angeles, where California’s gang database was found to have one-year old babies listed, activists and lawyers recently won a federal ruling barring police from imposing damaging gang injunctions, a civil court–ordered restraining order that restricts where certain residents can go, who they can be seen with and even what they can wear. Locally, the Daily News and New York Post want their readers to simply trust law enforcement. History may be repeating itself, with many people’s lives likely to be impacted. Either way, New York City’s editorial boards are happy to go along for the ride.